We all have tendency to update our Facebook status regularly. But this tendency of updating info about you may bring you in sites of criminals. Through Facebook we share our personal info and data which can be prove very risky for us if a wrong person got all these data and info. After reading this article you will get the answer of your question How to make secure your Facebook profile? It’s a common habit of fb user that he shares his and his families’ photo, update what is its location right now or may be on which tour he is going, what his plan of day etc is. Its true that it feels good when u get comment or likes on these updates but it may prove danger for you if all these updates reach to a unwanted person. Now day’s cyber-crime is increasing very fast. These info’s shared on Facebook may become tool for cyber criminals. • Your mobile number which people not hide often. • How many members in your family. • Your family members’ photos. • In which school your kids study. • Sometimes your car numbers. • What is your job and its location? • Your plan for vacation tour. • When will you go out of home and when will come. We share all these info on our Facebook profile in name of updating our status. But all these info can be enough to misuse and trap you in cyber-crime. Usually Facebook users are familiar with only common settings of Facebook. They become careless cause they have thought in their mind that all are friends here on Facebook, so why to take so care. They never think that by only searching their name anyone can reach to your profile and get all info if you are not having settings to avoid it. If you choose setting so that nobody can reach to your profile easily, it may be some difficulty for your friends to search but its will help you to stay away from unwanted persons. For girls there settings are really very important. Here we are discussing about those settings which are essential for you to secure your Facebook account. On the right side of your Facebook page you will see a symbol of lock, click there and choose settings for your profile. In Facebook profile you can see an option called About. This About option gives basic info about you like your job, your location, number, and address etc. So to avoid these info to reach to wrong people you should edit this setting. Go to profile page and choose option About. Here you will get option in Edit that with whom you want to share your basic info. In which you will find options of Public, Friends, Friends of Friends, Only Me or Custom. Here for sensitive info choose Only Me or Custom and select people to whom you want to share all these info. In your Facebook page on the upper part in right side you can see a sign of lock. When you click on this sign of lock you will see a question there that who can see your activities. Go to custom settings and limit your activities to selected people. As you click on lock sign you will get the question that who can contact me? Choose this option and there you find another option called Strict Filtering, select this option. When you select this option your friend will able to send you messages but no one else can bother you. Here you will also see an option that who can send you add requests. It will be good if you limit it to Friends of Friends. Doing this you will be get rid of unwanted friend requests. The most risky thing is sharing photos on Facebook. So be very careful while sharing your photos. On each sharing of photo in below of dialogue box in right side you will see and v shape option, click there and choose with whom you want share these photos. Same risk is in updating your status because by your status anybody can know your mood, your location etc. So while updating status choose people carefully with whom you want to share these info. Try to avoid tagging. Sometimes your friends tag open your secrets. For this click on lock symbol and go to see more settings. There go to Timeline and Tagging and click on How can I manage tags people add and tagging suggestions? There Enable Review tags people add to your own posts before the tags appear on Facebook? By doing this when someone tag you, that post can’t be share on your wall without your permission. Before giving permission you can select people with whom you want to share this. 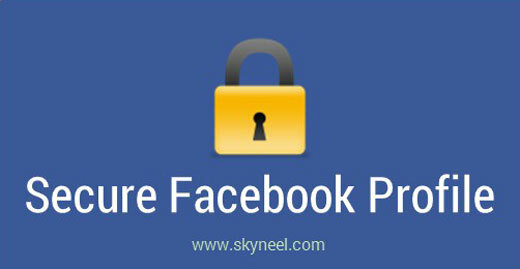 I hope you like this make secure your Facebook profile guide from which you will be able to easily make secure your Facebook profile without any extra efforts. If feel any problem in this guide then please use comment box. Thanks to all.